ChargeIt by Jay Clear Sunray Round Glass Charger Plate 13"
Home > Products > ChargeIt by Jay Clear Sunray Round Glass Charger Plate 13"
This item will be back in stock May 22nd. Order now to reserve. A stunning addition to high-end restaurants and upscale dining establishments, the ChargeIt by Jay Clear Sunray Glass Round Charger Plate 13" adds visual flair to any table setting. 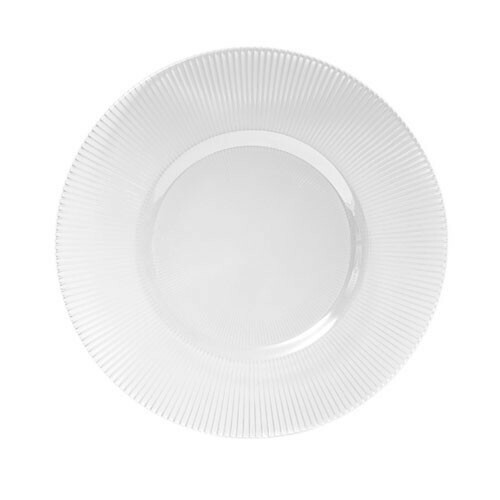 This clear charger plate boasts an attractive sunray pattern along the rim in lustrous pearl, adding a lavish touch to wedding receptions, extravagant parties, and other celebratory occasions. Made from high quality glass, this charger plate has a delicate look while being exceptionally durable and long-lasting. Thanks to its ample 13" surface, this charger plate is perfect for holding a variety of dinner plates and bowls of different sizes.